Who doesn't love a refreshing, juicy fruit salad in the summer? I love adding fruit to my salads, whether it's a leafy salad or a grain-based salad, like this quinoa version. This fruit salad is a bit different, in that it doesn't really have a base ingredient like lettuce or quinoa. Instead, it's just a simple combination of ripe fruits with fresh herbs, all marinated in a dressing made with freshly squeezed citrus juice. I had made a version of the original recipe for my family recently as a way to use up some ripe fruits that were lying around, and we all loved it so much that I had to make it again. I changed things up a bit this time, adding some grape tomatoes and chopped cashews for a bit of crunch. This salad had a lot of bright flavours, and I loved the creaminess of the avocado and mango with the juicy bursts of orange. This would make a great side dish for a summer BBQ, or you can also eat it like a salsa on top of chips or quesadillas. And if you're in Canada with a Sobeys store nearby, I recommend picking up some of their "light and airy pop crisps" and using them as a base to eat this salad with! 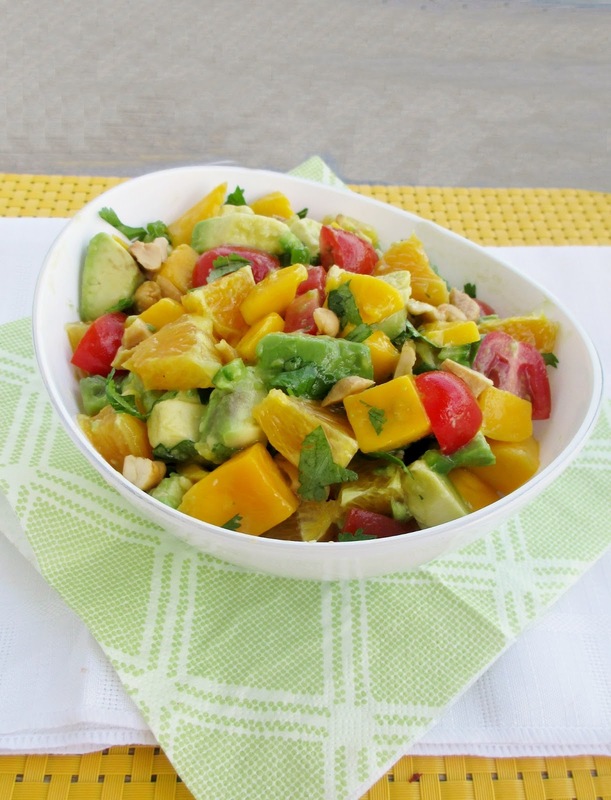 Combine the diced mango, tomatoes, and avocado in a bowl. Add the minced jalapeno and chopped cilantro and stir to combine. Peel the orange, using a knife to slice off all of the white parts of the skin. Carefully slice the orange into wedges. Take 2 slices and squeeze all of the juice out of them into a small bowl. Measure 1 tbsp of orange juice and set aside (if you don't get 1 tbsp, use another orange slice until you have enough juice). Chop the remaining orange slices into pieces and add them to the salad (you should have about ¾ cup). Add the lime juice and olive oil to the bowl with the orange juice. Season with salt and white pepper to taste. Stir or whisk to combine, then pour dressing over the salad, tossing to mix. Let salad chill in the refrigerator until serving time. Sprinkle chopped cashews over the salad when you are ready to serve. Oh my goodness this salad looks amazing!! I am so excited to make this really soon. I'm so thirsty on the bus right now so all that juicy fruit is killing me! Looks so bright and colourful too! Love adding fruits to my salads too- this looks so refreshing! i love fruit in salads! this looks so light and refreshing- perfect for summer! 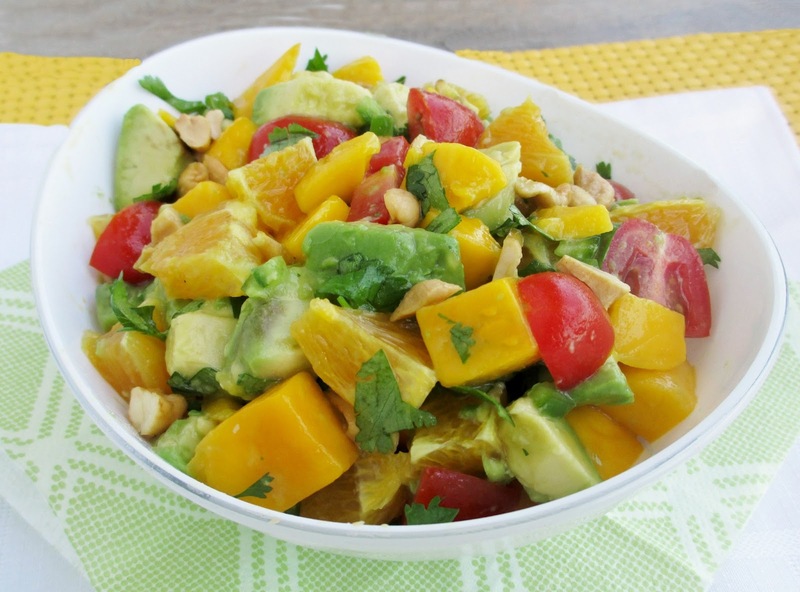 Avocado and Mango sounds like an amazing combo!